A brand new, state-of-the-art machine has made gastroenterology procedures at Broken Hill Hospital safer and is saving people from having to travel for treatment. The Operating Theatre has recently received a new diathermy ERBE machine which is used for interventional endoscopy to aid in the treatment of diseases of the gastro intestinal track. Diathermy is a medical and surgical technique involving the production of heat in a part of the body by high-frequency electric currents, to stimulate the circulation, relieve pain, destroy unhealthy tissue, or cause bleeding vessels to clot. Gastroenterologist, Dr Kenneth Lim, said the machine provides greater control over the electrical current required for the cutting, coagulation and devitilisation of tissue to treat such conditions as intestinal polyps, vascular lesions and bleeding ulcers. The machine can also be used for the treatment of intestinal bleeding by using Argon gas to deliver the electrical current. “The use of ERBE decreases the risk of perforation of the bowel during resection of large intestinal polyps,” said Dr Lim. “It has a lot of pre-set settings and has various functions.” The ERBE diathermy machine can also be used for gynaecology and general surgery procedures. “It’s a very good machine, it is state-of-the-art and top of the range available internationally. We are very fortunate to have it here,” he said. Ms Susan Beahl, Nurse Unit Manager of Operating Theatre, said at least 40 patients a year have been identified that would require the type of treatment using the machine and in the past these patients would be required to travel to Adelaide for the procedure. “This means that as well as providing a safer procedure for the patient, it has reduced the need for travelling interstate for procedures, saving considerable time and money,” she said. The ERBE cost $33,046.80 and was funded under the Far West Local Health District capital works funding. 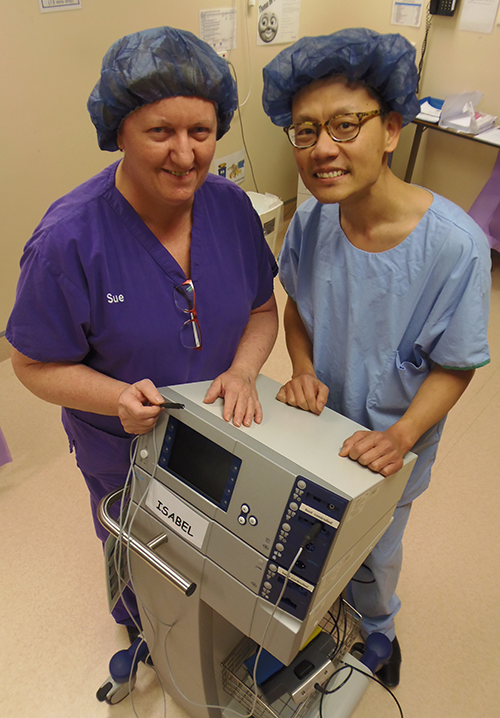 Dr Kenneth Lim and Ms Susan Beahl with the new ERBE machine in Operating Theatre.